Only 30 tickets available. Purchase yours online today. Those of us who live in this region relish the unique history, culture, stories, music, foods, and beverages of our German-influenced region just below the Potomac. After a hot and humid summer, we also crave the fall. On Thursday evening October 18, 2018, the Lovettsville Historical Society will put these all together in a program on the historic campus of Hiddencroft Vineyards, 12202 Axline Road, Lovettsville, VA 20180, from 7:00 to 9:00 p.m.
A fundraiser for the Lovettsville Historical Society for both our educational public programming and museum efforts, the program is meant to be a fun little October midweek break from the hubbub of work and crammed-full fall weekends. 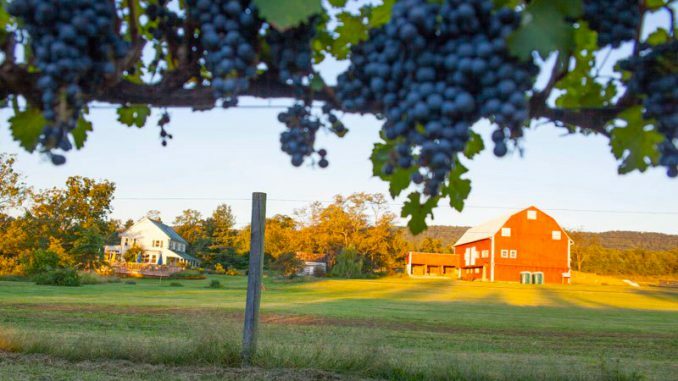 Hiddencroft Vineyards includes a number of historical buildings—a property dating back to our Revolutionary War Axline family. Owners Clyde and Terry Housel are very passionate about the history there, and do an excellent job acting as preservationists, stewards, and historians for the property. These buildings, including their historic house, barn, smokehouse, summer kitchen, and Springhouse, become the basis for our program. Participants will be treated to a history tour that includes four stops for tastings of multiple Hiddencroft wines paired with curated foods and stories from the farm, storytelling shared by Lovettsville Historical Society members from the Lovettsville area’s voluminous past, and music from local bluegrass band the Short Hill Mountain Boys. So—tasting, tales, and tunes it will be, having fun with your neighbors while helping support your local museum, lecture series, and history outreach efforts. Tickets are available online at www.lovettsvillehistoricalsociety.org under “Shop”” or click the ticketing link below. If you are not Internet-savvy, please call or text 571-318-8373 to purchase tickets. Tickets including history, music, food, and wine are $40.00 per person. To make this an intimate experience on a fall night, the program is being limited to 30 participants. The Lovettsville Historical Society is a 501c(3) educational non-profit working through its museum, lecture series, and educational outreach to bring the greater Lovettsville region more interest, curiosity, passion, and stewardship for our shared local history and historical landscape. Support our mission to preserve and protect the history of Lovettsville, The German Settlement, and our unique corner of Loudoun County, Virginia. Purchase a membership or make a tax-deductible donation today. The Lovettsville Historical Society, Inc. is a tax-exempt 501(c)(3) organization under the Internal Revenue Code. Contributions and membership dues are tax deductible under Internal Revenue Code Section 170.